Just another architectural jewel... 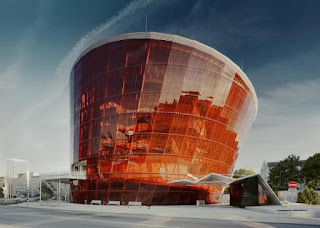 Completed last fall, this is the Great Amber Concert Hall in Liepaja, Latvia. A new cultural center and landmark for Liepaja, it was designed by Graz architect Volker Giencke. A facade of sparkling amber-colored glass encloses a concert hall for more than 1,000 visitors, plus rehearsal rooms, chamber hall, ballet studio, and experimental stage. The software used: Rhino, AutoCAD, Scia, and Nemetschek.